If you're reading this you can be sure that you belong to the 99% of humankind that can access the visible spectrum ... in brief, 'good sight'. Reading this article in colour implies you can tap into and decode the colour spectrum effortlessly, unlike the visually impaired or blind. We don't realise that seeing doesn't really take place in the eyeball, but in the brain. 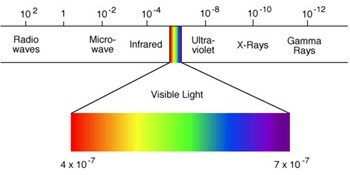 Remarkably this critical visible spectrum is just a narrow band of rainbow colours on a much broader electromagnetic frequency scale. This diagram puts it into clear perspective. The truth is we humans are mostly 'blind' to 90% of the available information that abounds in the universe around us. So let's deconstruct what we really mean when we talk of 'seeing'. As mentioned this takes place in brain, mainly in the occipital lobe to be precise, which is where the results of 'eyeball' reception are processed. This visual information leads to recognition, analysis, interpretation and assessment, all of which result in a chosen reaction. In fact there are many levels of seeing. Often when we say 'I see' we are going beyond the visual aspect. We are referring to our understanding of a situation. So how impaired are the blind? 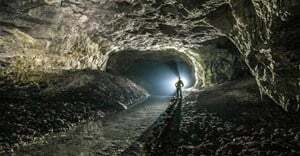 Admittedly they may not be able to 'tune into' the visible light that we sighted souls take for granted, but they are able to process information on other levels. Other senses such as touch, hearing, taste, and smell develop with practice and compensate for the loss of visible light. Take hearing for example. The visually impaired can 'tune' into audio frequencies (similar to a bat) and read their environment through 'echo-location'. In other words if blind people emit (for example) a click, they can 'read' their immediate location. This echo-location ability is not as developed as with bats, but many visually impaired people can "hear" large objects. According to the marketing director of the SA Guide Dog Association (SAGA) Pieter van Niekerk who is himself blind, adapting to a world without sight comes down to one thing. Attitude. One cannot prevent what life sends your way, but one can certainly choose how one adapts and reacts to the challenge. With Pieter his other senses have developed to a high degree: "With my ears I can 'see' this wall opposite me, and if I was walking down a long corridor I would be able to hear which doors are open or closed." Regarding touch, the visually impaired also become more sensitised to surface changes and they can tell the difference between tar and concrete for example. The way the visually impaired learn to adapt is astounding. Yet in spite of this, they still need assistance to move through the world to which we sighted people hardly give a thought. This core division of the Association is headed by Guide Dog Services Manager Gail Glover and one of her functions is to breed and train the best guide dogs for the job. Gail favours Labradors or Golden Retrievers besides other breeds. "These breeds are ideal as guide dogs because they are physically and temperamentally suited to the guiding role. They have a good level of concentration and they adapt well to the various changes that occur in the first 18 months of their lives." Over the last 60 years the SA Guide Dog Association has enabled around 1,500 visually impaired people to see through the eyes of their dogs. This life-changing institution was founded in 1953 by Gladys Evans, herself blind yet paradoxically a visionary. Before the new owner can take ownership of their dog, many levels of training are required. Guide Dog Services Manager Gail Glover heads up this section of SAGA and her hands are full. Apart from being responsible for the breeding and training of dogs, she trains guide dog mobility instructors as well as dog owners. 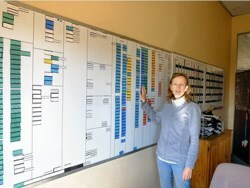 She also keeps track of the hundreds of guide dogs allocated to visually impaired people throughout the country. Nation-wide monitoring of guide dogs by SAGA. With this system Gail can identify the age of any guide dog, how long it has been with its owner, its current location and other key information. Guide dogs are remarkable animals that provide independence, mobility and companionship to their owners. Through exhaustive puppy and adult training they develop the competence to guide their owners through shopping malls, up escalators, onto public transport, into lifts, down stairs and along pavements. The dogs are also trained to do traffic work which heightens their awareness of traffic flow and moving vehicles. Guide dog owners negotiate road crossings by using their knowledge of the area and their sense of hearing. In the city, guide dogs are trained, for example, to take their owners to a kerb and then stop. At a traffic light the guide dog owner listens to the traffic cycles. When the blind person hears that the traffic has stopped, he or she instructs the dog to cross. But we live in an imperfect world and this is where the well-bred, emotionally balanced, intelligent guide dog excels in protecting its owner. A recent story tells of an owner who, when hearing no traffic noise, instructed her dog to cross the road, but it refused. And for good reason. A silent electric car was approaching which the owner could not hear but the dog could see. Being safety trained, it knew what not to do! In other words a guide dog knows when to disobey any command that would put its owner in danger. This ability, called 'selective disobedience' is one of the most remarkable things about a well-trained guide dog. It can balance obedience with its own assessment of a situation. But who actually leads who? In an 'owner-guide dog' team, the guide dog doesn't lead the owner and the owner doesn't completely control the guide dog; the two work together to get from place to place. The guide dog doesn't always know where the destination is, so it must follow its owner's instructions on how far to go and when to turn. 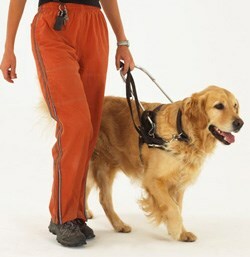 The owner can't see the obstacles along the way, so the guide dog must decide how to navigate their path. In other words each half of the team relies on the other to accomplish the tasks at hand. As a guide dog becomes more experienced with its owner, it may be able to take on even more responsibility. For example, many veteran guide dogs know all of their master's habitual destinations. The owner simply has to tell their dogs to "go to the office" or "find the coffee shop" and the guide dog will negotiate the complete route! 	Help the handler to board and move around motor vehicles, trains, buses and other forms of public transport. For the first 12-14 months the dogs selected for further training are given to puppy handlers to acclimatise them to daily living in the home and work environment and around town. After this phase they are then selected for further training in more specialised areas. This is SAGA's 60th year of operation. During these six decades, this fine establishment has improved the quality of life of thousands of visually impaired South Africans. In order to keep going, SAGA raises funds through a number of activities which are co-ordinated by marketing manager Pieter van Niekerk. 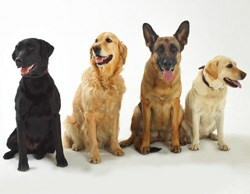 or visit the SA Guide Dog Association website www.guidedog.org.za. Thank you Roger, that is a wonderful piece!I was living in Wokingham earlier this year, where I walked past a beautiful property where they train 'seeing-eye-dogs' every day. And I often day-dreamed about what it must be like to train dogs for such a wonderful cause.Coincidentally, I often crossed paths with a guy who looked to be in his late 40's, who was always running and looking extremely fit and energetic - a tall, rangy character. I would move to the side of the pavement to allow him room to run past and he would thank me with such sincerity, it really made an extra-joyful start to my day.Eventually our 'conversations' became longer and longer and he would actually stop running to chat to me for a few seconds before we continued on our way. It turned out that he actually works at this dog-training centre and had been doing so for over 20 years.So my idle, day-dreaming question was answered; training dogs to help people, for the right person, is one of the most rewarding careers on the planet!